Today we are celebrating the memory of those diplomats who had the moral strength to act against the horror of the Shoah. Among them is enumerated Archbishop Angelo Rotta, Apostolic Nuncio who, during his assignment in Hungary, helped many Jews facing persecution to leave the country or to find secure refuge. In this he acted very similarly to the way followed by his friend and colleague Angelo Giuseppe Roncalli, Apostolic Delegate in Bulgaria and then in Turkey. However, the latter would have had a different future: he was elected Pope and took the name of John XXIII. He is now declared Saint by the Catholic Church. 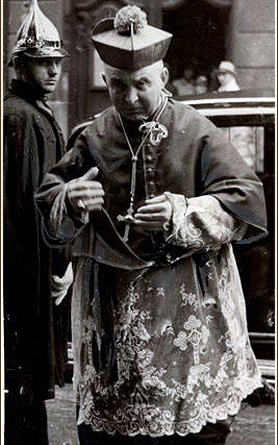 The friendship between the two is witnessed by the fact that John XXIII wanted to create Rotta a Cardinal, however he refused considering himself too old. These the specificity of Papal Diplomacy, the fist aim of which is to defend and protect all human beings, wherever and whoever they are, knowing that they are created at the image and likeness of God. They give us diplomates the courage to be less repetitive and bureaucratic, less centred on the interests, sometimes not even the noblest ones, of our respective countries, and recognize the lofty mission entrusted to us, above all to be the voice of the most poor and vulenerable. We need the perspicacity to understand this and the fantasy in exercising it, discovering even unconventional instruments to put it into practice. They Highlight that religion is not an obstacle but, on the contrary, an encouragement to mutual support, to condemn any violence regardless of creed, because what is considered to be sacred should be like a cape stretched out to protect all human beings and the whole universe, which is in itself part of its sacredness.